Founded in 1989, AHED’s mission is to promote professional growth and development of its members by facilitating programs that encourage, and support teaching performance to strengthen the education profession in the Haitian Community. They are active in discussing the specific educational issues concerning the Haitian community; educating the parents of their educational rights and strengthening ties with various groups /organizations that parallel their mission relative to the well-being of the community. Click on specific links for joining AHED and membership application. Since 1992, this Non Governmental Organization (NGO) supports children in difficult circumstances (street children, domestic servants and orphans) by providing them with shelter, schooling, psychosocial support, health, and vocational training. In addition, CAD conducts training sessions for the group OCBS and those who live with HIV/AIDS in the North West Department of Haiti. CAD’s mission is to care for the social reintegration of street children and those in conflict with the law. They work in partnership with the IBESR (Institut du Bien Être Social in French), a Haitian State Agency which refers the children to CAD. For now, CAD houses 75 to 90 children from the age of 7 to 14 years but their ultimate goal is to ensure 150 children per year access to education, vocational training, health, housing and a family environment. CAD is registered with both the Ministry of Social Affairs and Ministry of Planning in Haiti. The organization was able to fulfill their projects with the support of other organizations such as Terre des Hommes Swiss, Chaîne du Bonheur, Service de Solidarité Internationale suisse, PLAN - Haïti, UNICEF, OIM and CRS. Non-profit organization founded in 2006 dedicated to building communities in Haiti through the support of community-based activities on health and education. They financed projects all across the country for schools, orphanages and housing. They also work with Partners in Health / Zanmi Lasante to improve access to and the quality of education in the Central Plateau. For their projects, click here. To fund a community-based project, click here. Founded in 2007 by Unik Ernest and Michael Pradieu, Edeyo is an independent not-for-profit organization committed to improving the future of children in Haiti through education, supplying the students with learning materials and nutritional support. 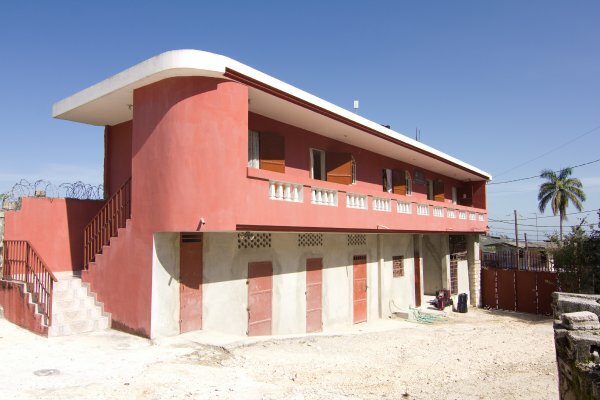 Edeyo has built and managed a primary school in Bel Air, Port-au-Prince. The school, École Communautaire du Bel-Air Herve Romain Cœur Joyeux (“École du Bel-Air”) currently serves about 300 students per year, all of whom had limited or no access to education until they enrolled in their program. The school is supported through Edeyo’s fundraising efforts in NYC. Click on links for school pictures, their projects, events, news, and how to get involved. A non-profit organization committed to rehabilitating the education sector in Haiti so that all children, regardless of their background, have access to quality schooling. They are fulfilling their mission by partnering with educators and schools who share their goal to provide quality education to Haiti’s children and to train effective and well-equipped Haitian teachers. They are currently rehabilitating 2 schools: Centre Montessori de Dépio(CMD), a preschool and elementary school in Port-au-Prince, to help provide quality education to students, and La Précieuse Ecole Montessori to establish an effective teacher training program. Click on specific links to learn about their Fellows Program and Teacher Training Program. A profile of schools in Haiti at the primary and secondary levels with comparison with the schools in the U.S. Non-profit organization founded in 2006 to provide education to impoverished Haitian children. Their vision is to offer Haitians the tools to rise above poverty, disease and oppression so they become self-reliant. They plan to build a school while they provide tuition, books and uniforms to students. Founded in 2007 by Odette Roy Fombrun, this not-for-profit organization is a family foundation that is managed by Odette’s children and field experts in areas of fundraising and other resources. FORF’s main goals are to promote education and development in Haiti by implementing the beliefs and values of Konbitism ('coooperation') supported by Odette Roy Fombrun and extensively described in her many books and articles. FORF is committed to raising funds and identifying the best recipients capable of implementing projects that are aligned with the foundation’s values and mission. They implement projects in various regions of Haiti. Click on the specific links for information about donations, resources, projects in tourism and caves in Haiti, and other projects. For website in French, click here. Areas of service: Earthquake relief, Education, Tourism (Touris Lakay) and Civism. GGH’s mission is to provide primary school education and environmental sustainability education through their public forums and community -based projects in under-served communities of Haiti. They encourage the use of local renewable energy particularly solar applications, through education, micro-finance and technology donations for community infrastructure. GGH works closely with community leaders and local volunteers and in 2010, they started a reforestation project where they plan to have more than 300,000 trees over the next 5 years. For volunteerism, click here. For their blog, click here. HEF’s mission is to provide educational opportunities to children in St. Matthias and Ascension Parishes in the Southern mountains of Haiti. Following January 2010 earthquake, about two-thirds of their schools were damaged and they are determined to rebuild future schools with earthquake and hurricane-resistant standards. For a listing of their schools’ locations, click here. For their quarterly newsletter, click here. For information on HEF guesthouse, click here. A non-profit organization committed to supporting and improving the medical education system in Haiti by working closely with Haitian medical leadership, faculty and students. Created after January 2010 earthquake, HME’s goal is to work towards restoring and building upon the infrastructure and curriculum of Haitian medical schools and teaching hospitals, and ensuring that the next generation of Haitian doctors and medical leaders are ready to care for Haiti. The HME Project focuses on three main areas: Curriculum Development, Distance Learning and Continuing Medical Education (CME). For an overview on their projects, click here. To get involved, click here. A non-profit organization that provides a learning computer center to facilitate online classes of computer science and business administration in Haiti through their partnership with the University of the People. HCN currently has 20 students enrolled and 60 students on a waiting list. Students are awarded a 2-year Associate degree in computer science or business administration from the University of the People that provides the online education from Pasadena to Haiti. HCN’s model of education is proven to empower students to be self sufficient through direct employment post graduation. They want to secure more funding to expand their online programs and to enroll additional students. The cost per student per year is $1,600U.S. (infrastructure costs, nutrition and free online education). HCN is now offering a “Four for Forty” sponsor program where 4 people can contribute $40 a month to support one Haitian student’s online education. To invite HCN for a presentation, click here. To visit HCN, click here. For HCN’s online infrastructure, click here. Focus areas: Online programs (Computer Science& Business Administration), Graduate internships, ESL classes , Hands on workshops (interview &resume writing), Feeding program, and Studio apartment rentals. Go to Haitian Connection Network's Website. Non-profit organization dedicated to increasing educational opportunities for all Haitians while promoting Haitian cultural awareness and creating a better living environment. HEP is currently working on the following projects : Agricultural Project in Cap-Haitien- Northern Haiti, Tampa Project that offers English and computer classes to the Haitian immigrants in the Tampa Bay Area and Distance Learning Project for online classes to professionals in Haiti. For an overview on their specific projects, click here. Founded in 1988, HOPEH is a nonprofit, spiritual, organization committed to strengthening the lives of Haitians residing in the Juampas, a village situated near the City of Lascahobas, in the North East part of Haiti. HOPEH is the only NGO working in Juampas and provides the villagers with education, medical care, and clean water program. Click the specific links for their current programs, needs, volunteer travel package, and how to get involved. Focus areas: Primary school (grades 1 to 6), Medical clinic, Dental clinic, Soup kitchen project, Water filtration projects with the Carroll Country Haiti Mission Project (CCHMP), Mosquito netting project. Founded in 2011, NAHP is a non-profit organization dedicated to providing Haitian professionals the right tools for leadership positions throughout the U.S., so they can be attuned to the cultural awareness and sensitivity vital in the management of the nation’s diverse workforce. The organization welcomes partnerships that result in the creation of intellectual and economic wealth within the Haitian community. Click on links for information about their membership, scholarship program, scholarship sponsor, sponsorship / partnerships, events, and donations. Founded in July 2004, this organization was founded by Rebecca and Frederick Crosby to provide assistance for secondary and post secondary education to Haitians in the Artibonite Valley. Their curriculum focuses on Primary School, Secondary School, Technical School and University Program. Click on the specific links to learn about their students, directors and programs. For sponsorship opportunities and their current needs, click here. Christian non-profit organization that provides educational opportunities to impoverished children and adults in Haiti. Since the devastating earthquake in 2010, THEA has been facilitating sustainable solutions in one community at a time by partnering with local skilled workers who help to empower families and their communities through the education of marketable skills. THEA provides tuition assistance to students at the primary/secondary, vocational/college levels; ongoing community education programs in gardening, sewing classes, and community health and rehabilitation; and short-term projects for children and adults with hands-on learning experience in these areas, simple construction, and more. THEA has a college fund to support the education of young men and women pursuing health and rehabilitation professions in Haiti. For an overview of their projects, click here. To get involved, click here. Founded in 2000, the Foundation works in partnership with members of the Ti Plas Kazo community of Port-au-Prince, Haiti, to provide food, educational opportunities and after-school programs to impoverished children. Click on links for their photo gallery, upcoming events, programs and how to get involved. According to the Foundation their programs have provided over 5,000 meals each week, more than 200 school scholarships each year, an after-school program for 240 youth and a summer camp for 550 children. Areas of service: Food & After-school programs, School Scholarships, Summer Camp, Children’s Garden project.